Summerville, Ohio is about to go through some major changes and there is a lively cast of characters. Abby has just arrived with her placid Newfoundland because she inherited her grandmother's coffee shop. Daisy's mom has left her Jack Russell with her "just until my allergies clear up" then rushes off to New York for shopping. Then there is Shar. Professor of ancient history trying to fulfill a promise to her mother (dead) to finish her grandmother's (also dead) book. Shar has a dachshund and one morning she wakes up to growling, there's a god in her bedroom. And to top if all off, an ancient goddess has moved into the History department. Rumor has it used to be a temple before it was dismantled and brought her as one of the school buildings. Too bad the top floor became the professors house. You know, the one with a god in the bedroom! Shar has a boyfriend, another professor who lives above the coffee shop. Abby's grandmother promised him cookies so stuffed-shirt that he is, he demands Abby fulfill the commit or return the deposit - a deposit that was given to her dead grandmother! Noah, handsome assistant to none other than Kammani Gula, Mesopotamian Goddess of Love, Goddess of Life and Goddess of Healing. And modern-day trainer of dogs. Then there is Mina. Mortuary Mina, Grad student in the history department. Writes all her papers on disasters. If someone died horribly in history, Mina's your woman. There are seven women in the dog obedience class, each with baggage ;-) Noah, Kammani, the god Samu-el and various community members complete this outrageous cast. This is a fun, fast-paced and quirky book. 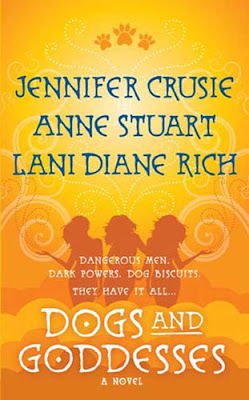 There are misunderstandings, unlikely friendships, betrayals, enlightenment and talking dogs. Oh, did I forget to mention that? Kammani seems to be a dog worshiper and after drinking a "tonic" in the obedience class the girls can hear their dogs talk. Not over done, more of a four-legged character. I read this earlier this year and I'm ready to return to Summerville. update: I should have said the coffee shop was dusty and Abby doesn't know how to bake!